Candidate Sarah Atterberry could not attend the forum, so attending candidates for the ward were Mary Lynam-Miller and Todd Roach. Lynam-Miller gave her opening remarks first. She’s lived her for 12 years, coming to the area after her husband, now retired from the Air Force, was stationed nearby. Her family, which includes a 21-year-old stepdaughter and eight-year-old twins, lives in the Timber Creek neighborhood. “My professional background is in human services, which means I work to improve the quality of life for seniors and people with disabilities in our community. At 28, I was the youngest state director of services of the Mentor Network, which is a nationwide human services provider. In that capacity, I oversaw the creation of two programs for people with disabilities from the ground up, and at the same time developed and managed a multi-million dollar annual budget,” she said. Roach gave his introduction next. “I was born here, I grew up here. I’ve had the pleasure of serving the community for well over ten years in different roles. I have a passion for the community.” He mentioned his four daughters, and his wife, being art of why he’s passionate. “I’m here to have that passion, combined with my management experience and years as a small business owner that give me a unique perspective that’s needed to help the city. The issues before us continue to be about balancing fiscal responsibility with sound judgment. As a small business owner, I know what it means to have expenses and have to balance a budget. I believe the foundation of any thriving community should include a smart growth focus. With many years of corporate experience, I know the importance of planning those long term objectives. The primary role of an alderman should be being an advocate for people in their neighborhood. When it comes to local government, it’s all about helping your neighbor,” he continued. Roach was selected first during the random question round. Asked “How heavily do your personal feelings matter when voting on a project that may technically meet all of the city’s requirements, but you feel isn’t right for the city,” Roach responded that it would be a balance and come down to knowing what the residents want. “You have to get out and talk to them and get their feedback. If I have a personal feeling about something, I may push back and ask questions and learn and find out more to understand and overcome objections, but at the end of the day, if my residents that I serve overwhelmingly support something, that’s what I was elected to do is to serve their will. If you’re talking about something that’s a win for the city and your residents support it, it may be something I personally object to, but it’s something the city needs and our residents want,” he explained. Lynam-Miller was asked what she felt O’Fallon was missing as a city. “O’Fallon has so much. I think whenever we look at the growth and new development coming up, I think it’s going to be really important for us to identify specific areas that we can improve. I think we have beautiful green spaces, obviously. I think in the long term, I’d really like to see light industrial, which I think is something that is in the works out on Rieder Road. I also think that we could use more arts and cultural development. I would love for people to come here for soccer and tell their family and friends about all the great things to see and do in our community, and then come back for those arts and cultural activities,” she said. She added that in knocking on doors she heard many residents asking for improved pedestrian and bicycle access, particularly downtown, which could alleviate parking issues. The second question, asked of both candidates, was why they felt they were more qualified than their opponent to run for city council. Roach answered first, saying “I’ve served the community for ten years, whether that’s as vice president of the District 90 school board or now as a township trustee. I know the inner workings of local government, I know how they work well together, and how sometimes they don’t work well together. Bringing that experience to the council, I don’t think anyone else has that experience now, nor do any of the candidates here. I think it’s a valuable piece, along with being a small business owner. Having to know what regulations do to your business, having to understand what different things go on with a budget due to not only your business, but also to your family budget, and then also my love and commitment to the community.” Roach also mentioned that he has done service projects throughout the community with local agencies like Habitat for Humanity, and truly enjoyed getting out and speaking to residents. Roach was the first to give closing remarks, citing his love for the city that has been in his family for generations, including grandfathers that worked in the St. Ellen coal mines up through his decision to raise his own family here. “This isn’t my first or second time being involved in the community. Being a former District 90 board member and being a township trustee, I have a lot of experience in the community, but also as a youth sports coach and working with the Special Olympics, Habitat for Humanity, and several other things,” he said. He added that working with other local governments gives him a unique perspective, and he would like to figure out how to lower the tax burden on residents, which may not be the city’s fault, but layers of governing bodies, and he wants citizens to vote on any new tax. Continuing to cite his fiscal acumen, applaud local fire, police and EMS services while making their needs for serving the community a priority, and replacing or maintaining infrastructure. Roach would like to alleviate drainage issues for residents, as well as possibly building a sidewalk between the high school and the Metro RecPlex along Route 50, all things that came up when he was knocking on doors. He plans to continue to work with residents to help address their needs, and to use his experience and knowledge to work for residents. She added that residents have told her their concerns include traffic, infrastructure and drainage problems, and maintaining the small-town feel of O’Fallon as the city continues to grow. 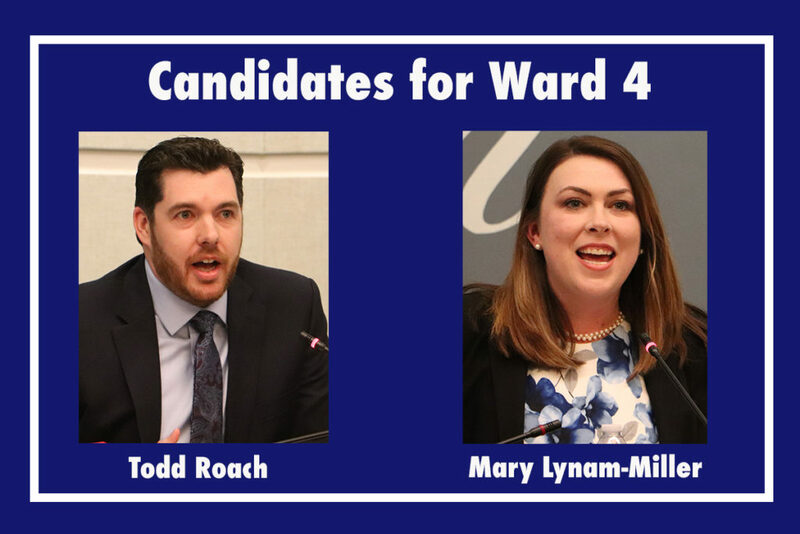 She feels confident that she can bring tenacity to the council, and will be ready to go on day one to begin working for her ward, and wants to use her professional and service background to continue to maintain and improve quality of life for residents while making decisions based on values like fiscal responsibility.